Data security is a hot topic for many companies these days. But for those who need to adhere to security standards like PCI DSS or HIPAA, security is not an option. We showed you sometime back how to encrypt Galera replication traffic, but for a more complete solution, you’ll want to encrypt all database connections from client applications and any management/monitoring infrastructure. With ClusterControl 1.2.9, we introduced a number of features to facilitate this, including the ability to add new nodes to an encrypted Galera Cluster. cmondb_ssl_key - path to SSL key, for SSL encryption between CMON and the CMON DB. cluster_ssl_key - path to SSL key, for SSL encryption between CMON and managed MySQL Servers. cluster_ssl_cert - path to SSL cert, for SSL encryption between CMON and managed MySQL Servers. cluster_ssl_ca - path to SSL CA, for SSL encryption between CMON and managed MySQL Servers. Details on the configuration options above is explained in our ClusterControl Administration Guide under Configuration File section. Please upgrade to ClusterControl controller version 1.2.9-708 or above before performing the exercise explained in this blog post. Upgrade instructions are available here. The following steps should be performed on the ClusterControl node. $ ssh 10.0.0.21 "mkdir -p /etc/ssl/mysql"
$ ssh 10.0.0.22 "mkdir -p /etc/ssl/mysql"
$ ssh 10.0.0.23 "mkdir -p /etc/ssl/mysql"
** This section has been updated on 28th January 2016 to reflect the new feature introduced in ClusterControl 1.2.12. Click "Proceed" to start the job. Take note that this action will rolling restart the Galera cluster. Re-import the Galera cluster configuration files at ClusterControl > Manage > Configurations > Reimport Configuration so we will have our configuration template updated with the latest configuration version. 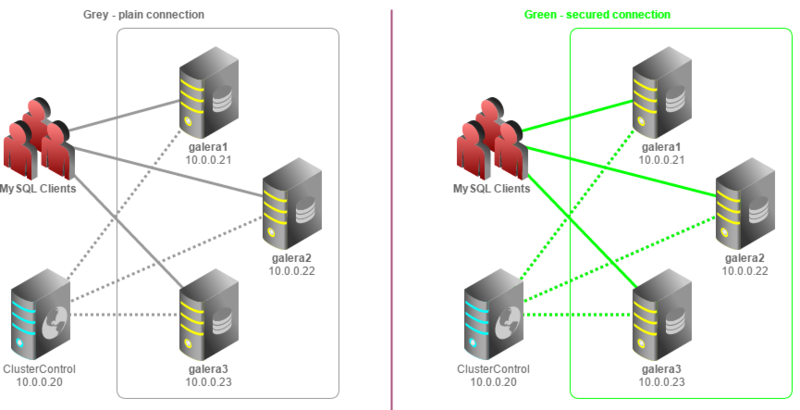 Our Galera cluster communication and replication are now running in an encrypted environment. The following steps should be performed on all MySQL nodes (including ClusterControl node) so they can accept client connections through SSL. ** Replace <ClusterControl IP address> and <cmon password> with respective values. Our Galera nodes are now able to accept client’s connections through SSL. Monitor the output of /var/log/cmon.log or /var/log/cmon_<cluster ID>.log and ensure CMON does not throw any errors regarding connection to the CMON DB and the managed MySQL nodes. Our cluster is now running in fully encrypted mode, from ClusterControl controller process to CMON DB and the managed MySQL nodes. At the time of writing, the ClusterControl UI has a limitation in accessing CMON DB through SSL using the cmon user. As a workaround, we are going to create another database user for the ClusterControl UI and ClusterControl CMONAPI called cmonui. This user will not have SSL enabled on its privilege table. These files will not be replaced when you perform an upgrade through package manager. You should now able to connect the Galera nodes through SSL. All connections from client applications and ClusterControl are now fully encrypted. You can see from ClusterControl > Performance > DB Variables that the certificate and key are loaded inside wsrep_provider_options. This tells us that Galera is now communicating and replicating through a secured channel. That’s it. You are now running a fully SSL-encrypted Galera Cluster!